Are you thinking about stocking stuffers yet? Because I am! I just came back from hitting up my local CVS Pharmacy and found 10 great ideas for you and your family. Whether you have a toddler who loves car toys or a tween who is all about the lotions and potions, CVS can be your one-stop-shop. Not to mention that you will earn ExtraBucks® Rewards while you shop. In case you are new to the program, EBCs are like “free CVS money” that can be used on most things at CVS Pharmacy. Unlike other confusing points-based loyalty programs, ExtraBucks® Rewards were designed to make it very easy for cardholders to redeem their rewards by spending them on nearly anything they want throughout the store. Shoppers earn 2% back on nearly all purchases made throughout the store as Quarterly ExtraBucks. YAHOO! Ok, onto those stocking stuffers. 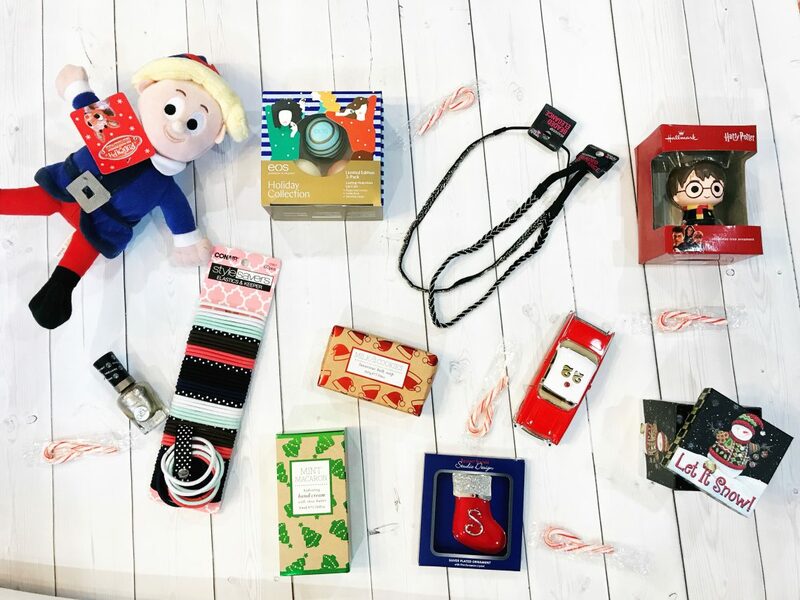 Let’s break down what I bought for my family – one piece at a time. Ornaments: Whether you are looking for personalized pieces or cartoon versions of your favorite fictional characters, CVS has it all. I actually had the hardest time in this department because I couldn’t decide who to purchase. Harry Potter eventually won out. All three of my children enjoy those movies and books. Can’t wait to place this guy on our tree!!! Plush Toys: You will find a variety of plush toys – Christmas related and not – at CVS. I couldn’t resist picking up one from the Rudolph classic. It is one of our favorite holiday movies to watch. Period! Beauty Sets: There was such a variety for me to choose from in this department. I opted for one from EOS because my daughter LOVES using those lip balms. The holiday collection set actually comes in three flavors for her to choose from. Hair Accessories: Do you live in a house that loses bobby pins and hair ties? I know it just isn’t me! Every month or so, I have to pick up a new package of hair ties for me and my girl. I mean, where do they GO? I really want to know. Seriously. This is a stocking stuffer everyone can use. Truly! As a second part to hair accessories, I also picked up Natalie some really cute headbands. Also on sale! I love when I get my kids exactly what they want/need AND I find it on sale!!! 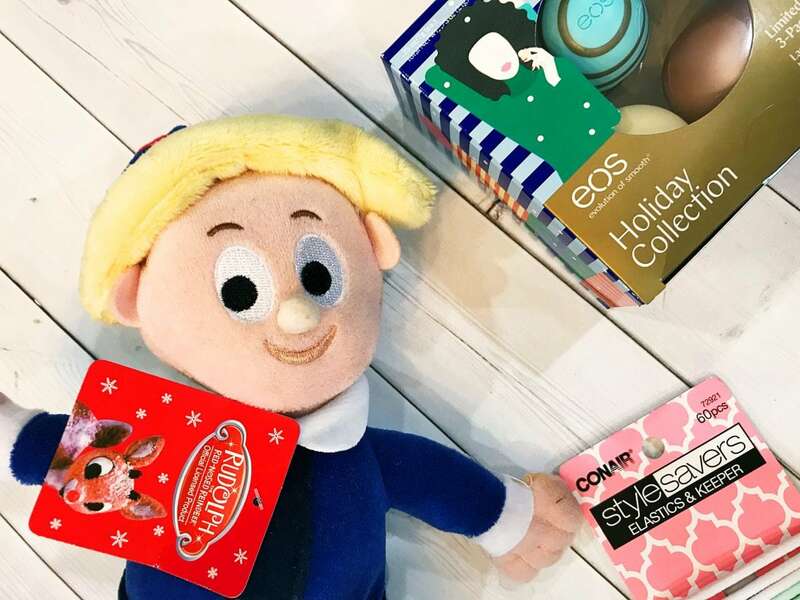 Hand Creams: You can opt to pick up a household favorite OR you can check out some of CVS’ new holiday focused lines instead. 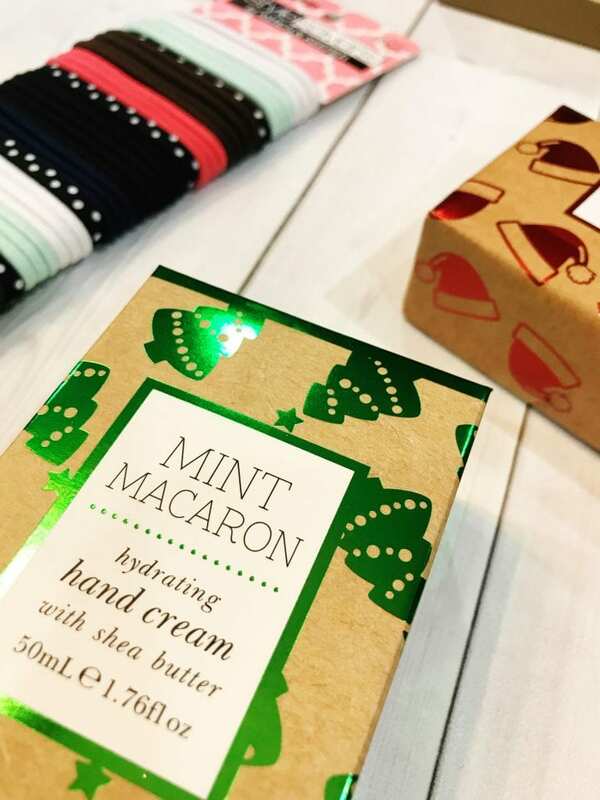 I opted for the Mint Macaron hand cream. I love that it’s already wrapped and ready to go. As a reminder, be sure to check out the ExtraCare Coupon Centers before you make any purchases. You know, those red kiosks where ExtraCare members can scan their cards before they shop, to print available coupons or quarterly ExtraBucks® Rewards they can use right away. It’s such a great way to save time and money because the Coupon Centers also function as price-checkers. Some shoppers even call it the “Magic Coupon Machine.” LOL! Car Toys: There are plenty of mini toys all around CVS. I was drawn to this classic looking style which retailed for $5.99. I can tell you right now that this will be Caleb’s favorite thing to play with on Christmas morning. I just know it. Nail Care: Ok, another one just for me. I confess. I usually get my gel manicure done at a salon. That means I’ve NEVER tried the at-home comparables and am so eager to do so! 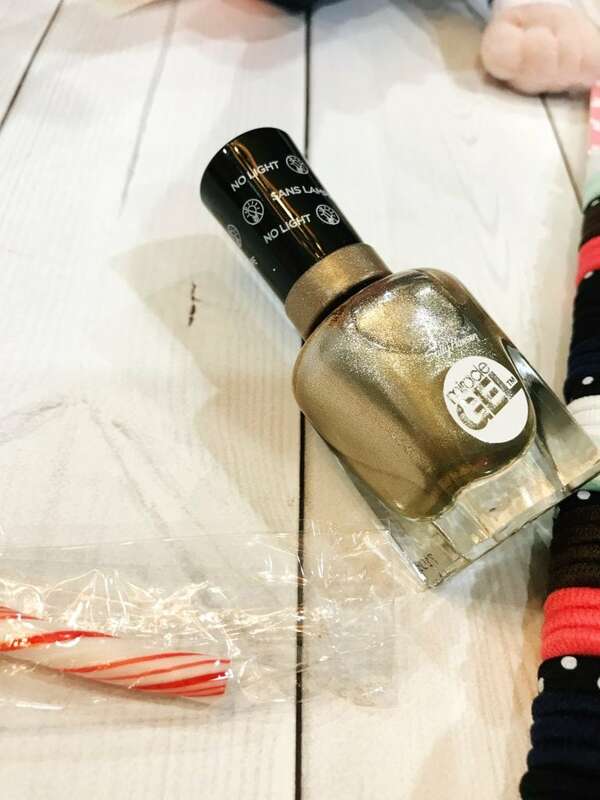 I opted for a metallic gold – one of my favorite year-round colors. Santa – how did you know? When you are ready to pay, be sure to use CVS Pay which allows you to use your CVS Pharmacy app to checkout at the store. All you have to do is add any of your credit or debit cards to your account and you will be good to go. When you are ready to check out, show the store associate the barcode in your app. Talk about hassle-free! These purchases snagged me a few ExtraCare Bucks and it felt like I was getting a present back from CVS. All members receive savings in the form of personalized coupons, weekly circular deals, and automatic discounts when they shop at CVS Pharmacy. Come join in on the fun! And by the way, if you want to shop at home and do and have your order delivered from a participating store right to your car – you CAN thanks to CVS Curbside pickup! We all know that the weathers can get a little bit crazy in December. I am not a huge fan of running in and out while it is snowing. Not only do customers get to skip the line but they can forget the hassle of in-store shopping altogether! CVS Curbside Pickup is now available in 40 major markets across the U.S., including many locations in Boston, New York City, Philadelphia, Houston, Los Angeles, Chicago, Phoenix, Dallas, Seattle and Washington, DC. What do you usually pick up for your stocking stuffers? Do you shop at your local CVS during the holidays? As a busy mom of three, I am always so thankful for stores that allow me to pick up a variety of goods all during one trip. It seems like there’s never enough time in the day anyway! At least when I shop at CVS, I can knock several things off my to-do list. I love all of these! This is why I love CVS. I get my prescriptions and a heck of a lot more. Thanks! These are such good ideas. I pick something up every now and then to save for stockings. I could definitely pick out a few personal care products from CVS the next time we’re there. I always have a hard time finding stocking stuffers. I like the hair accessories and nail polish ideas! I remember the elf from Rudolph! I could get one of those and some hair accessories! I never knew CVS carried all these things! I had no idea that CVS had all of this. Perfect for stocking stuffers or last minute gifts. These are really great ideas. I have always loved stuffing the stockings. Stockings are one of the best parts about Christmas. It is so fun to fill them and see the kids faces win the morning. Lovely ideas! CVS is a really great place to look for some unique stuffers. I love these ideas! Just in time for my Christmas shopping! Thanks for the ideas! This is why I love shopping at CVS! 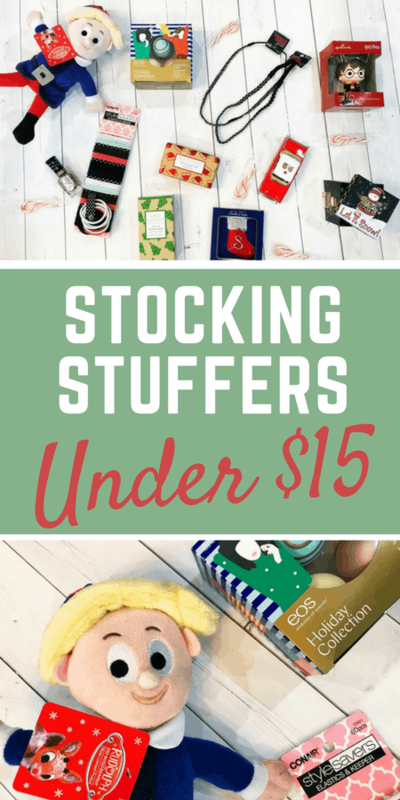 This is pretty awesome and I love that there are so many choices when it comes to stocking stuffers that’s also very much affordable! Thank you for these ideas. I still need to buy a few more stocking stuffers and your suggestions are good. I will check them out the next time I am at CVS. I’m always on the lookout for these because I set a budget for my Christmas shopping so I don’t spend too much! This would be really helpful! Thank you!